So, the virus remained within the enzootic vector, Cs. melanura, for the most part this year. Yet we still had 4 horse cases. When horse cases occur, the mosquito control agencies are very quick to increase monitoring around the site, and did not find other infected potential bridge vectors. This points to the possibility of Cs. melanura acting as the bridge vector, something that data from the northeastern US has suggested previously. (from infection potential: Armstrong, P. M., & Andreadis, T. G. (2010). Eastern equine encephalitis virus in mosquitoes and their role as bridge vectors. Emerging Infectious Diseases, 16(12), 1869–74. doi:10.3201/eid1612.100640 and from bloodmeal potential: Molaei, G., Oliver, J., Andreadis, T. G., Armstrong, P. M., & Howard, J. J. (2006). 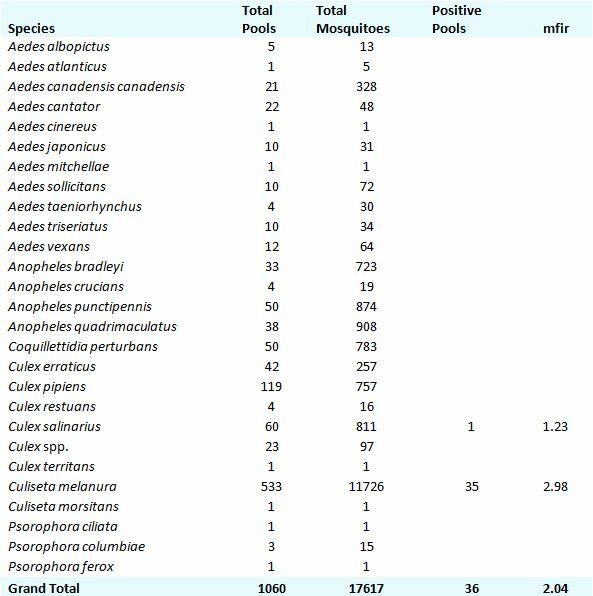 Molecular identification of blood-meal sources in Culiseta melanura and Culiseta morsitans from an endemic focus of eastern equine encephalitis virus in New York. The American Journal of Tropical Medicine and Hygiene, 75(6), 1140–7. Retrieved from http://www.ncbi.nlm.nih.gov/pubmed/17172382.) The first paper also suggests that even though Cs. melanura may take mammalian meals in small percentages, their higher titer values, particularly in the absence of other positive vectors, make them a candidate for transmission to horse and/or humans. This has not been a really unusual year with regard to WNV infections. More Ae. albopictus pools showed up positive but this is likely due to the inclusion of testing albopictus for Dengue and Chikungunya and the subsequent increased effort by the mosquito control agencies. To date, there have been seven human cases and no reported horse cases. 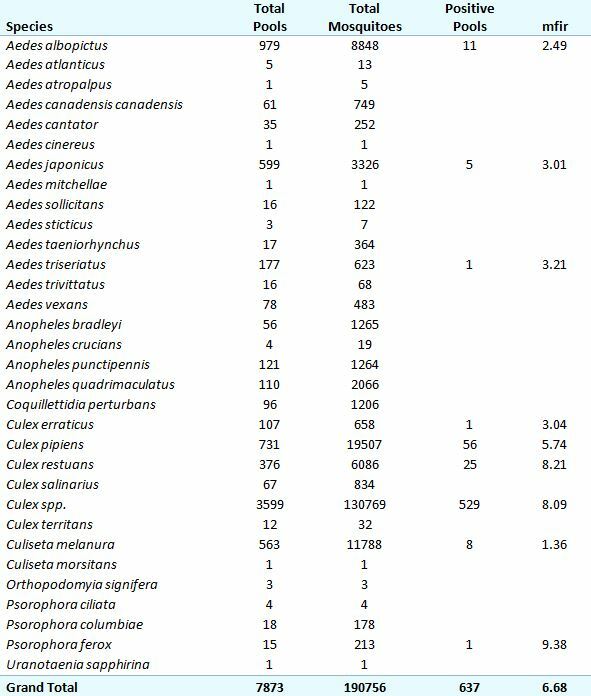 18 out of 112 birds tested were positive, and mostly corvids. A final report will be posted when available. This entry was posted in Uncategorized and tagged Culiseta melanura, Eastern Equine Encephalitis on November 5, 2014 by Lisa Reed.